PanARMENIAN.Net - An art critic from Gyumri, the second largest city of Armenia, Andranik Avetisyan was awarded the New Talent and Creative Idea prize at the Artistes du Monde international contemporary art exhibition in Cannes, which took place from September 23 to 26, Rusarminfo reports. In Cannes, fifteen cobweb-made works by Avetisyan were showcased. 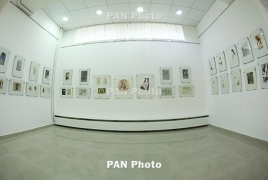 The exhibition in Cannes was the first venue where Avetisyan's works were displayed, his paintings have never been shown in Armenia in public. In 2012, Avetisyan was running for the post of the mayor of Gyumri.